This rally is the main reason I have been so slack doing my blog since …. forever! (October last year, actually). I was the Rally Manager and all my energies and efforts were channeled towards creating a fantastic experience for our CMCA Solos Network members when we met in Campbell Town, Tasmania from 28th February to 6th March this year. For those of you who follow my blog I’d like to explain that our Solos group are motorhomers that travel by themselves – it is not a singles club in that most of us are quite happy travelling solo and not looking for a partner. It provides a safe group of travellers that we can link up with as we journey around our beautiful country. It was a wonderful experience for me and I loved every minute of the planning, preparation, putting together a week long program and then seeing it come to fruition with the help of my Rally Team, some of the local residents and businesses and of course my sister, Marion who lives nearby. The Campbell Town Showground was a great venue with big buildings and plenty of room for us all to park. It was ‘rustic’ – our main building was a 75 metre long sheep pavilion – and the smell of the sheep never really left it even with all the doors open. Here’s how I first saw it when I arrived in Tasmania in June 2016 and the Campbell Town Show was on. Not long before our rally started the Show Society held a working bee, so this is what the pavilion looked like without the sheep! And then we filled it up with happy Solos ready to party! The theme of the rally was Life is Magic so we had witches and wizards, fairies and fortune tellers dressed up for our night of Magic and Mystery. A spit roast dinner was provided and the night kicked off with our very own witches dance that our members had learned and practised with our member/instructor Karin Kirk. One afternoon we had an Op Shop Fashion Parade where members unwanted clothes plus those from the local Op Shop were ‘modelled’ by some of our group. What a funny day! So much laughter even the townspeople were talking about it! Our Skit Night showcased our talented members – or those who thought they were talented – and it was another night of laughter and friendship. Here’s our Line Dancers and our First Timers performing. Before the main crowd arrived on the Monday we had a special dinner to thank our Volunteers and welcome our First Timers. You can’t keep a Solo seated for long when there’s dance music playing. The local Solos Chapter, The Tassie Shearwaters, organised a great Fun Day for us. Some of the activities were quite challenging but I’ll let the pictures tell the story. There’s a huge age range among our members and 2 of them celebrated their 80th birthdays at Campbell Town – Nev, our chief bus driver and Miss Information (or was that misinformation? ), Elaine. We even found a special booth for her. The local towns people were delighted with the boost to their businesses while we were in Campbell Town. Our mini bus ferried us back and forth daily to the supermarket and coffee shops and we totalled up our shopper dockets at the end of the rally and we had spent over $65,000 in town during the rally. This is a huge amount for the economy of a small town of only 700 people. You can see it was full on and wouldn’t have been at all possible without our hard working volunteers and everyone who came along to have a good time. You made it happen! Acknowledgements: Thank you to the many members who posted some of these photos on our Facebook page and I have ‘borrowed’ them to illustrate this blog. Contributors include Rosanna Grifone, Jenny McLelland, Fay Byrnes and Shannon Lightfoot. Categories: Australia, Camping, Rallies & Events, Tasmania, Travelling | Tags: Campbell Town, Campbell Town Showground, motorhome rally, motorhomes and campervans, Solos Rally, Tassie Solos Rally, travel | Permalink. I have been to Sheffield, the town of murals, before but this time I was enticed to go by the Medieval Festival being held there. …. and Railton, town of topiary …. This part of Tasmania had suffered severe damage from floods a few weeks ago, the roads were still very chopped up and there were piles of debris along the banks of the Mersey River. The Latrobe Caravan Park had been evacuated and was undergoing repair, and now I hear on the news tonight that the latest downpour has damaged it once again. The free camp in Sheffield is at the Recreation Ground and the Medieval Festival was happening right next door so I was looking forward to a great weekend……until it rained! It was just too wet to enjoy the festival, dodging the showers and trudging through the mud, so I only spent a couple of hours there and decided not to stay another night in the hope the weather would improve. Many of those who attended got into the mood with period costume, and I couldn’t help thinking, as they dragged the hems of their gowns through the mud, that it was probably exactly like that in Medieval England, without the benefit of washing machines! The market stalls sold all things Medieval … anyone need a new visor? battleaxe? And then I was off to find my knight in shining armour – except the mud took the shine off most things, including the jousting knights. When the Medieval Festival isn’t happening in Sheffield, the town is famous for it’s murals that adorn the walls of the buildings and also panels in a ‘mural’park behind the Information Centre. Some of these are so realistic you feel you could step right into them. As I mentioned before there is a free camp at the Recreation Ground for fully self-contained vehicles. No grey water to be let onto the ground. It is beside the leash free area for your fur babies. It is a little way from the centre of town – too far to walk in the rain when I was there. I can’t leave Sheffield without sharing the fabulous sign at the front of the Info Centre – and yes, the arrows are pointing to real places nearby. Categories: Australia, Camping, Tasmania, Travelling | Tags: Axeman's Hall of Fame, camping, Latrobe, Medieval Festival, murals, Railton, Sheffield, Tasmania, topiary, travel | Permalink. Bridport is on the north east coast of Tasmania, a pretty fishing village with many small cove like beaches. The caravan park and camping ground extends for ever along the foreshore but was cost prohibitive for me at $25 a night for an unpowered site. It did have lovely beach/bush camping areas though. There are extensive walking tracks around the area and along the waterfront that direct you to some of the local historical landmarks like the old jetty. 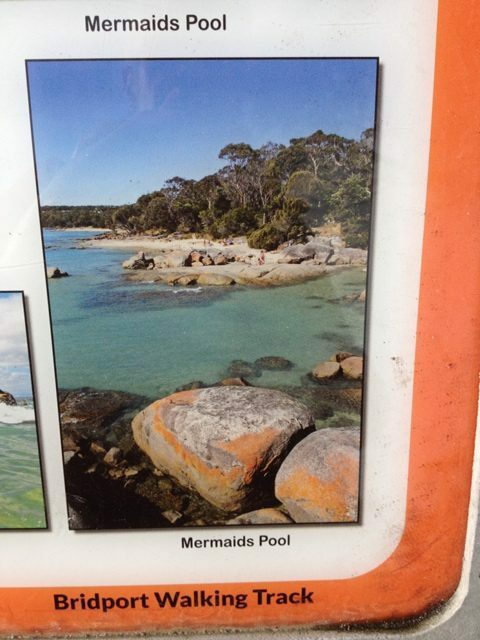 There is lovely safe swimming here in what is delightfully called Mermaids Pool, naturally created by the rocks and the tide. It makes you wish you were a mermaid! At the entry to the town you cross a small inlet where a couple of fishing boats are moored and I also noticed fish hatchery ponds on the way in. I love the look of these old jetties when you look up the creek the other way! They don’t look too substantial, do they? I was in Bridport to get the canvas replaced on Brutus the Beast, my pop top campervan and I can highly recommend Kerry, the Canvas Man from North East Canvas if you need any canvas work done. I know some of my travelling buddies have often needed awning repairs etc, so he’s your man when you’re in Tasmania! He was so quick – within 24 hours the old canvas was gone and a brand new PVC ‘hat’ was installed. Happy Campers: There is no free camping in Bridport and the caravan park has a monopoly on waterfront locations. There is free camping at Scottsdale, just 20kms away, but that is the subject of another blog! Categories: Australia, Camping, Tasmania, Travelling | Tags: beach, Bridport, campervan, camping, canvas repairs, free camping, Tasmania, travelling | Permalink.